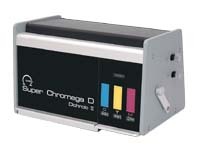 Refurbished Super Chromega D Dichroic II Colorhead for Omega 4x5 D-series enlargers. This is the renown Super Chromega D Dichroic II lamphouse, the colorhead used on Omega 4x5 enlargers in commercial and school darkrooms for more than 35 years. For installation on Omega D-2, D-3, D-4, D-5, D-6, and ProLab II enlargers. Requires either a #412-021 Standard Power Supply or Chromegatrol stabilized power supply and timer. 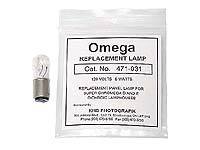 If replacing a condenser lamphouse on an Omega chassis, a different set of lamphouse lifting arms will also be required. These colorheads have been reconditioned by a factory trained technician to work as well or better than new, and we provide a 1-year warranty.